People want to make their homes beautiful and attractive to the outside world. They are in search of anything that can give the interiors an elegant and attractive look. Neon Pictures are one of the modern technologies that aid them in giving the look they want. Neon Pictures combine both art and technology and gives a very special look to the place where it is used. Neon Pictures are works of art and creativity like Photos, Posters and Pictures highlighted with real light bulbs and colors. They use LED bulbs, fiber optics real colored neon tubes and small replaceable bulbs. 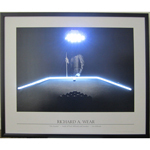 These lighting effects enhance each framed work of art. Each one is different and not all pictures have all lighting effects. The lights in these Neon Pictures can be installed permanently into the picture and it looks like the actual scene. Neon Pictures can have a different color and range of visibility. The lights used in Neon Pictures can be connected with accessories for animation of their brightness. Further options are constant light, fog and dimmer. Also these lights give attraction to thee pictures, which help deliver the message easily. The Neon Pictures use a wonderful combination of technology and creativity. These Neon Pictures give a sense of beauty to the place where it is placed. One of the easiest ways you have to light a dark corner in your bedroom or add some atmospheric lighting to your living-room area is by using Neon Pictures. With numerous designs, shapes, colors, dimensions or lighting abilities, these pictures constitute one of the most convenient methods one has to alter the lighting tone and individual mood of a room. These Neon Pictures may be of different varieties and based on different themes. A theme is a consistent idea used throughout a room to create a feeling of completeness. These themes often follow period styles. They may be photographs or prints or delicate watercolors. Wall colors with loose flowing patterns and dull tones in the lighter greens, grays, blues, reds and yellows can be easily harmonized with such pictures and be shown them at their best. Neon Pictures add beauty and elegance to the interiors of the house. Neon Pictures are becoming popular day by day. Nowadays parents can make cartoon characters for children to hang in their bedrooms or washrooms. Hot favorites are those from animated movies such as Ice Age, Finding Nemo, and more recently Madagascar. They are good to hang in your den or kitchen, too. Neon Pictures are becoming popular with enthusiasts and people who like to design and decorate their own houses. Neon Pictures can accent any home or business. There can be several themes from pool, to general artwork, including neon pictures with Marilyn Monroe, James Dean, Humphry Bogart, The Three Stooges and more. They can even help decorate your office or shop in the most elegant manner. You can even put up your own picture and transform it into a Neon Picture. Selecting a Neon Picture with pleasant background and hot contrasting mixture of one or more colors of your choice, added with your choice of lettering, make your interior look more attractive and grand. It makes your home or shop more visible to the people and hence they can easily find the way inside it. It gives a sense of comfort and an ambience that suits everything around the room where it is kept. To make it more effective, you can also put some symbols and graphics. It is a different way of representation and this might help increase traffic at your place. Hence, the technology today has given a great asset in the form of Neon Pictures. They give elegance, attraction and beauty to wherever it is kept. It is said that a picture can speak thousand words. With Neon Pictures, this is definitely true.